The first tow truck was not built atop some heavy-duty truck chassis, as one would expect, but atop a 1913 Cadillac. As the Chronicle and different sources have related the story, Ernest Holmes, a mechanic in Chattanooga, Tennessee, got a call on day in 1916 from his old business school professor, John Wiley, who had driven his Ford Model T off the road and upside down into a creek bed. Holmes eventually got the T out of the creek bed and upright, but it took eight hours and six men and untold amounts of manual labor. The experience gave Holmes an idea, though: Back at his shop, he outfitted a three-year-old Cadillac – which sat on a fairly stout 120-inch-wheelbase chassis and which used a 365.8-cu.in. L-head four-cylinder engine for power – with a crane and pulley system that would lift broken-down and wrecked vehicles and secure them for a tow back to a nearby mechanic’s shop. After reconstructing his idea with a pair of outriggers to provide stability while hoisting other vehicles, Holmes filed for a patent for his amazing new idea (US Patent 1254804) in November of 1917. Holmes didn’t stop there, though. 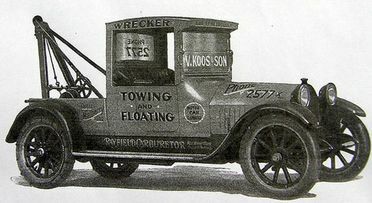 With his new patent in hand, he refocused his business to building Holmes Wrecker tow trucks and selling them to other mechanics and garage operators, advertising them as a means of literally capturing more business. Indeed, he became a rather prolific inventor afterward, patenting around a dozen improvements on the general tow truck theme as well as at least another half-dozen vehicle lifts, creepers, and jacks before his death in 1945. This article was used by the internet source Wikipedia.